Alumna Megan Riley '04 is running the Boston Marathon for Steppingstone! 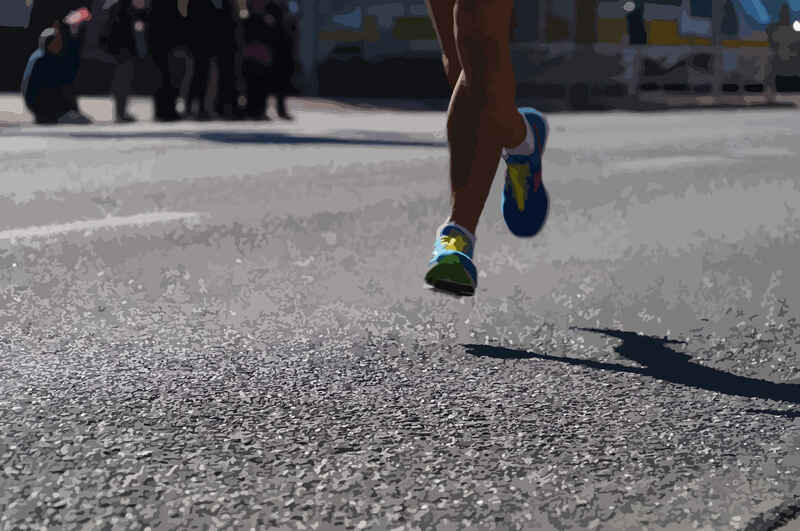 "Please support me as I proudly run in support of Steppingstone Scholars." Read Megan's story below. Why Am I Running for Steppingstone? 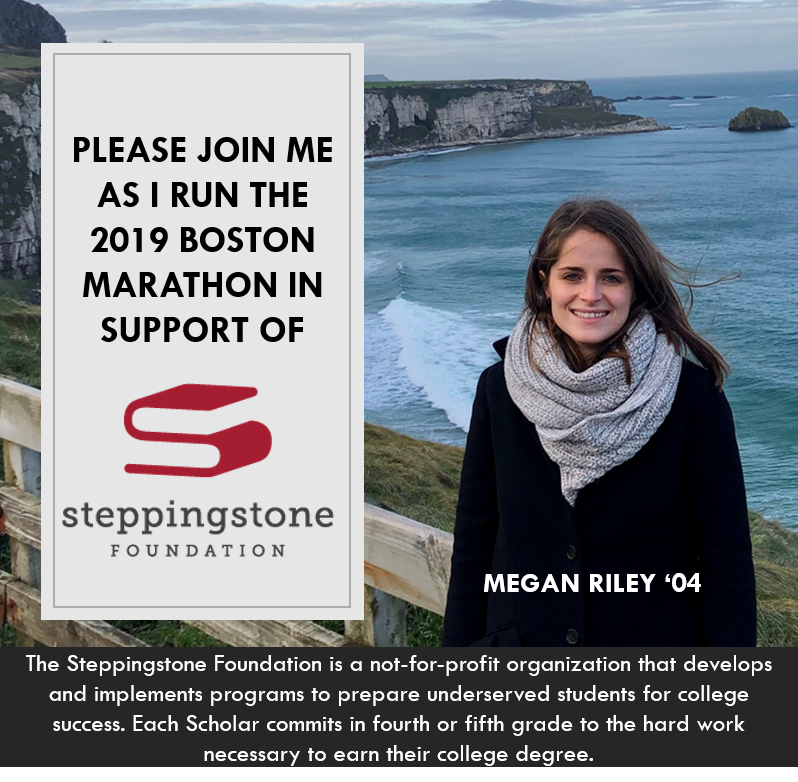 I'm Megan Riley and I am thrilled to be running the 2019 Boston Marathon for The Steppingstone Foundation! Steppingstone has been a part of my life since I was 10 years old, and I am honored to be able to give back to this organization that has given me so much. Steppingstone serves high-performing underserved students in the city of Boston in an effort to help close the opportunity gap by preparing and supporting them on their path to college. I was the first person in my family to graduate from college, and I owe much of that to Steppingstone – and my parents. However, my story is only one of thousands. Steppingstone serves 1,600 students each year, and has more than 800 alumni, all of whom would attribute so much of where they are today to this incredible program. My journey with Steppingstone began with a thorough application process and then 14 months of academic prep in addition to my normal school work. You may be wondering – why did I need Steppingstone? I was a smart kid, couldn't I have just continued to excel in school and it would've all worked out? The answer to that is simply no. As a student in Boston Public Schools, resources are limited, and a young person's success is heavily determined outside of their regular class work. Lucky for me, while my parents did not go to college and couldn't help me very much with my Algebra homework, they recognized that if I was going to live they life they dreamed for me, I was going to need more. This led them to have me apply for Steppingstone. Over two summers and a full academic school year, Steppingstone gave me the edge I needed to gain admission to Boston Latin School. At BLS, I was comforted by familiar faces from my Steppingstone classes and thrived academically due to my extensive preparation. The emphasis on encouragement and academic success that started when I was so young continued throughout high school, led me to Boston College, and helped me succeed through college graduation. Today, I serve as co-chair of Steppingstone's Board of Young Professionals. Now in its second year, the board is focused on engaging the next group of community leaders with Steppingstone through volunteering, fundraising, and networking opportunities. Please consider donating to my marathon run for Steppingstone to help other scholars just like me cross the finish line of college graduation! Good luck tomorrow! So proud of you! So awesome to see you running the marathon again and raising money for such a great cause! You’re going to crush it tomorrow! So proud of this girl ! Go Meg go ! GO MEG GO!!!! Love you! Good luck Meg!! You go girl! Run Meg Run! I love you! So proud of you Megan! So proud of you Megan, you will rock this run!! Thanks to Megan Reilly for putting her feet where her heart is!